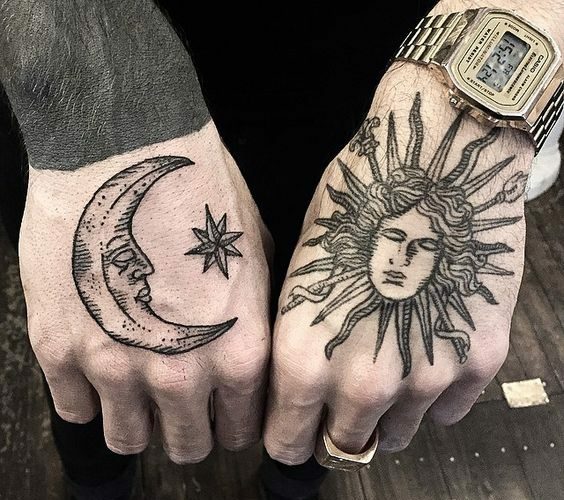 Sun and moon tattoo look great separately on the skin. But if you want a more impressive tattoo, you should think about joining these two elements into one. Sun and moon have always been one of the fundamental symbols in almost every culture since the beginning of the time. 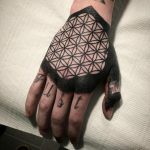 So, let’s take a look at these marvelous cosmic bodies and their tattoo designs. First of all, let’s take a look at the sun and moon symbols separately. The symbolism of the sun is obvious. It is the one who is responsible for life on Earth since its heat makes the climate ideal for all living creatures. The sun does its job by rising every day, warming and nourishing the planet earth. It supports life for all living creatures. Also, the sun is the symbol of masculine energy, light, and heat. Since the ancient times, many cultures worshiped the sun as a god. For example, the ancient Egyptians had three gods that represented the sun. The first one – Horus (the rising sun), the second one – Ra (zenith sun), and the third one – Osiris (the sunset). The moon is probably even more mysterious than the sun. It does not emit light, and its brightness is only the reflection of the sun. The moon is a symbol of femininity and fertility, and its cycles represent the rhythm of time. It enlightens the night sky, and its gravity affects the tides, pregnant women and even the mental state of many people. But what happens when we join these two symbols? Well, first of all, we are combining the two meanings of the different bodies. We combine lightness and darkness, man and woman. They embody a union of the two opposite poles that together create a harmonious unity. Sun and moon also represent the two extremes of nature, that are necessary to achieve the balance and stability on earth. So, as we can see, the sun and moon are influencing us every day, without us even realizing it. Actually, without them, we wouldn’t even exist. It is a universal symbol that will always be recognizable till the last day of the humans. We leave you with beautiful sun and moon tattoo designs, and we hope you will find the inspiration you were looking!